My Creative View: LOAD-Day 3: Who am I? LOAD-Day 3: Who am I? Day 3 and I am feeling good! The sun is out, it's Friday and I've got a 2 pager finished, and in the book. Bette yet, I get to add this to the Frosted Designs Friday Challenge-use ribbon and/or twine. Awesome! Because the theme of LOAD is "Past Perfect", I have a stack of old photos ready to go. Although many of the memories that go with these old photos belong to my parents, it's been fun to have them out and around me. My son gets a kick out of them as well. Today's LOAD prompt is "Who Am I Now"? Good question. 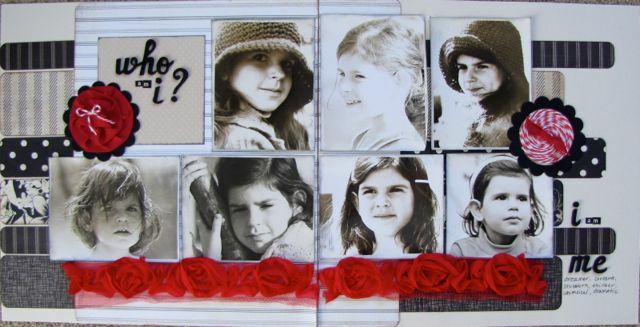 There were a group of photos of me, about the same size, all black and white, of different expressions, but of varying ages. I know one of them is a favorite of my Dad's. I tried to imagine what those expressions meant then, knowing that I still make some of the same faces and expressions now. I'm sure some mean the same, and some are very different. I used a LO I started in a CKC class. I changed the entire LO design and embellies. the only thing that is the same is the PP selection and placement. Supplies are Basic Grey, Bazzill, Glubers, Glue Dots, twine, ribbon, ink,Thickers, Tiny Type. I love using twine on Glubers. So fun! 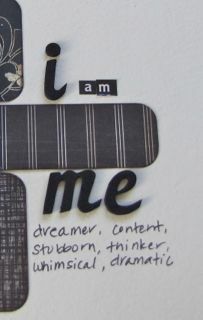 I came up with the answer, "I am me", with some adjectives describing me know and possibly then. Original don't you think? What a great layout!! Love the question and the answer! The photos, embellies and ribbon are great too! I Love that page!!! Look how cute you are!!! Oh wow!! Love the b&w photos!! Amazing 2 page layout!! Love the colors, too!! Thanks so much for playing along with us at Frosted Designs! !